Video image of the standard wing section with a slat at Mach 0.78, and an Angle of Attack of 0.77 degrees, showing vorticity in the flow. The video with CVG is of the same section, with the CVG applied behind the slat step. 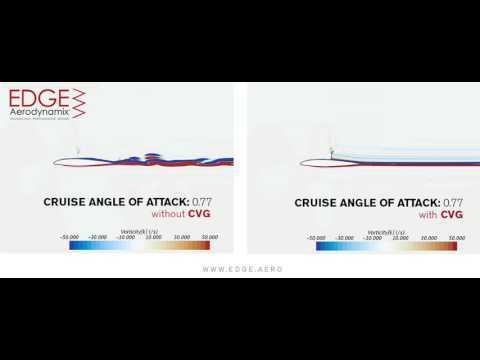 The shockwave is observed in both of these cases, and is consistent with the in flight imaging of the shockwave on the B737 wing at Mach 0.78.